offsetting earlier gains made on speculation of more easing by the U.S. Federal Reserve. earlier. The broader Topix  shed 0.2 percent to 748.67.
decision to buy hundreds of billions of dollars in U.S.
government debt to try to foster a stronger recovery. debt, now twice the size of its $5 trillion economy. strategist at Mitsubishi UFJ Morgan Stanley Securities. would step down as head of the ruling party within the week. is unlikely to come out soon," said Fujito. fell 0.8 percent at 2,192 yen in heavy trading. support from fighting in Libya and disrupted Nigerian exports. WASHINGTON — Standard & Poor’s removed the United States government from its list of risk-free borrowers for the first time on Friday night, a downgrade that is freighted with symbolic significance but carries few clear financial implications. Political gridlock may have resulted in the downgrade in the country’s credit rating. The company, one of three major agencies that offer advice to investors in debt securities, said it was cutting its rating of long-term federal debt to AA+, one notch below the top grade of AAA. It described the decision as a judgment about the nation’s leaders, writing that “the gulf between the political parties” had reduced its confidence in the government’s ability to manage its finances. “The downgrade reflects our view that the effectiveness, stability, and predictability of American policymaking and political institutions have weakened at a time of ongoing fiscal and economic challenge,” the company said in a statement. The Obama administration reacted with indignation, noting that the company had made a significant mathematical mistake in a document that it provided to the Treasury Department on Friday afternoon, overstating the federal debt by about $2 trillion. “A judgment flawed by a $2 trillion error speaks for itself,” a Treasury spokeswoman said. The downgrade could lead investors to demand higher interest rates from the federal government and other borrowers, raising costs for governments, businesses and home buyers. But many analysts say the impact could be modest, in part because the other ratings agencies, Moody’s and Fitch, have decided not to downgrade the government at this time. The announcement came after markets closed for the weekend, but there was no evidence of any immediate disruption. A spokesman for the Federal Reserve said the decision would not affect the ability of banks to borrow money by pledging government debt as collateral, a statement that could set the tone for the reaction of the broader market. 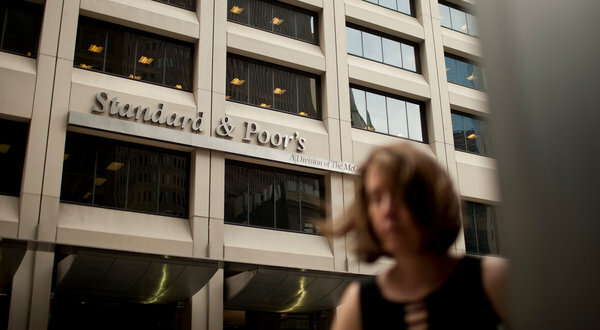 S.& P. had prepared investors for the downgrade announcement with a series of warnings earlier this year that it would act if Congress did not agree to increase the government’s borrowing limit and adopt a long-term plan for reducing its debts by at least $4 trillion over the next decade. Earlier this week, President Obama signed into law a Congressional compromise that raised the debt ceiling but reduced the debt by at least $2.1 trillion. On Friday, the company notified the Treasury that it planned to issue a downgrade after the markets closed, and sent the department a copy of the announcement, which is a standard procedure. A Treasury staff member noticed the $2 trillion mistake within the hour, according to a department official. The Treasury called the company and explained the problem. About an hour later, the company conceded the problem but did not indicate how it planned to proceed, the official said. Hours later, S.& P. issued a revised release with new numbers but the same conclusion. In a release on Friday announcing the downgrade, it warned that the government still needed to make progress in paying its debts to avoid further downgrades. “The downgrade reflects our opinion that the fiscal consolidation plan that Congress and the administration recently agreed to falls short of what, in our view, would be necessary to stabilize the government’s medium-term debt dynamics,” it said. The credit rating agencies have been trying to restore their credibility after missteps leading to the financial crisis. A Congressional panel called them “essential cogs in the wheel of financial destruction” after their wildly optimistic models led them to give top-flight reviews to complex mortgage securities that later collapsed. A downgrade of federal debt is the kind of controversial decision that critics have sometimes said the agencies are unwilling to make. On the other hand, S.& P. is acting in the face of evidence that investors consider Treasuries among the safest investments in the world. Yields rose before the Congressional deal on fears of default and a possible downgrade. But after a deal was struck, yields sank as money poured into Treasuries as a safe haven from sharply falling stocks and the turmoil of the European debt markets. On Friday, the price of Treasuries fell sharply in heavy selling, and yields rose, reversing the moves of recent sessions. The 10-year Treasury note ended the day with a yield of 2.56 percent. The United States has maintained the highest credit rating for decades. S.& P. first designated it AAA in 1941, reflecting a steadfast belief that the richest nation in the world would not default on its debt payments. The rating was also bolstered by the role of the dollar as the world’s leading currency, ensuring that demand for American debt securities would remain strong in spite of burgeoning deficits. Experts say the fallout could be modest. The federal government makes about $250 billion in interest payments a year, so even a small increase in the rates demanded by investors in United States debt could add tens of billions of dollars to those payments. In addition, S.& P. may now move to downgrade other entities backed by the government, including Fannie Mae and Freddie Mac, the government-controlled mortgage companies, raising rates on home mortgage loans for borrowers. However, because Treasury bonds have always been considered perfectly safe, many rules prohibiting institutions from investing in riskier securities are written as if there were no possibility that the credit rating of Treasuries would be less than stellar. Banking regulations, for example, accord Treasuries a special status that is not contingent on their rating. The Fed affirmed that status in guidance issued to banks on Friday night. Some investment funds, too, often treat Treasuries as a separate asset category, so that there is no need to sell Treasuries simply because they are no longer rated AAA. In addition, downgrade of long-term Treasury bonds does not affect the short-term federal debt widely held by money market mutual funds. In other words, almost no one would be precluded from investing in federal debt, and even the ratings agencies have concluded that few investors would walk away voluntarily.